There are several components to any downhill ski equipment package. Depending on your style of skiing and ability level, equipment packages can be tailored to your specific needs. Pair of skis: Skis come in a variety of shapes and sizes. To determine what you feel most comfortable with, consider renting skis until you find what type works best for you. Bindings: Boots are attached to the skis with bindings. Bindings can be set to the skier's ability, height and weight. They are what releases your boot from the skis during a fall and it is important to have them adjusted correctly for safety reasons. Boots: It is essential to have your ski boots fitted properly. A pair of boots that are too tight or too loose can make skiing miserable. Try several pairs in order to get the ones that best fit your feet. 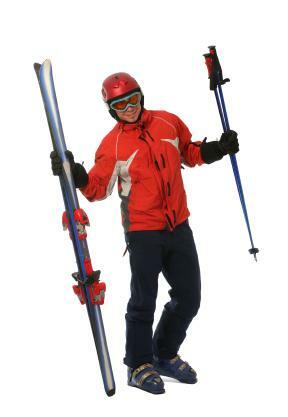 Poles: A pair of poles help you balance and turn while skiing. They come in different lengths and weights. The lighter the pole, the less tired your arms will be after a day of skiing. Ski equipment comes in styles for men, women and even kids. Many styles are unisex while others are gender specific. Since equipment is expensive, make sure you purchase the type that best matches your needs and at the best possible price. Many sites and stores allow you to create your own downhill ski equipment package while others give you the option to choose from an already made package. One example of an equipment package is the K2 Four R Downhill Ski Package. It is sold at Sunlight Sports and includes K2 Four R skis, Salomon C509 bindings, Head Ezon boots and Scott Alpine poles. It also includes mounting and a season of tune ups. It costs under $300 and is a great value package for those just beginning to ski. For those looking for a great deal, remember that shopping off season will save you money. Often retailers deeply discount new equipment that is from the past season or in a style that has been discontinued. There are also ski equipment outlets that feature great deals. Another great way to save on ski equipment is to buy used. There are sites online, such as eBay, that offer a wide selection of equipment as well as package deals. This option will give you discounts on gently used or often never used equipment.